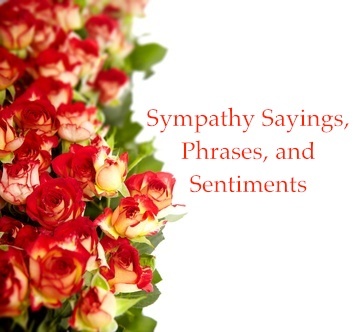 Here is a collection of sympathy sayings and phrases for you to copy into your cards or to tell to the florist when you send flowers. It can be difficult finding the right words to express sympathy so there are many different pages on this site for you to look over and choose what suits you. More are being added. • Please accept my condolences on the loss of your insert loved one here ie. mother, father, friend, husband, wife, etc..
• You are on our minds and in our hearts. • We were saddened to hear the news of your insert mother, father, friend, husband, wife, etc.’s passing. • I will always be grateful to have known your insert loved one here. • Memories of insert deceased’s name will be cherished always. • May God give you strength and healing during this most difficult time. If you want to say something unique condolence words, just be yourself. What’s more important is that you will be there with him and listen to him when the he needs someone to talk to. Maybe you can talk other things just to divert his attention from being lonely. It won’t be easy but try you’re best to cheer him up.